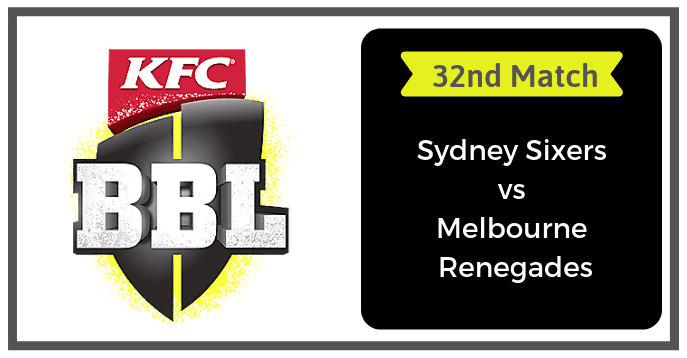 Today Match Prediction of Sydney Sixers vs Melbourne Renegades, 32nd Match Preview, Playing 11, Injury updates, News and Dream11 Prediction. If you are looking for SDS vs MLR Dream11 Prediction then you are are the right place. Sydney Sixers is all set to take on the Melbourne Renegades on Wednesday, January 16, 2019, at Sydney Cricket Ground, Sydney. If you want to know who will win then you are in the right place. In Today’s Dream11 Fantasy Cricket Match of SDS vs MLR, we will cover Pitch Report of Sydney Cricket Ground, Sydney, Predicted Playing 11, Toss Prediction, and Fantasy Cricket News and Tips. Who Will Win Today Between SDS vs MLR 32nd Match? Pitch Report of Sydney Cricket Ground. Sydney Sixers and Melbourne Renegades are in the same boat but in a different position in the points table. Both the teams have played an equal number of games and won the same number of matches. Both the teams will love to improve their points by winning today’s match. Sydney Sixers has played eight matches, won four and lost four matches. They are in the third position of the points table with eight points in their pocket. The Sixers have lost their last match against the Perth Scorchers. DP Hughes has scored the maximum runs for SYS team and SNJ O’Keefe has taken maximum wickets for his team. Dan Hughes, Jordan Silk and Moises Henriques are the top scorers of the Sydney Sixers team. They have scored 224, 207 and 188 runs in the last eight matches respectively. Steve O’Keefe, Tom Curran and Sean Abbott are the top wicket-takers of SDS team. They have taken 13, 11 and 11 wickets respectively. Melbourne Renegades have also played eight games, won four and lost four games. They are in the fifth position of the points table with eight points in their pocket. After winning two back to back matches they have lost their last match against Brisbane Heat. The batting department failed poorly in the last match. Sam Harper, Dan Christian and Mohammad Nabi are the top scorers of the MLR team. They have scored 189, 134 and 132 runs respectively. Kane Richardson, Cameron Boyce and Jack Wildermuth are the top-wicket-takers. They have taken 11, 6 and 6 wickets respectively. Daniel Hughes, James Vince, Moises Henriques, Jordan Silk, Tom Curran, Sean Abbott, Tom Curran and Steve OKeefe are the key players of Sydney Sixers Team. Moises Henriques will lead the SDS Team. The SYS team management has announced 13-players squad. They have made one change in the squad. Lloyd Pope has replaced Justin Avednano who got injured. Daniel Hughes, James Vince and Moises Henriques will lead the batting department. Steve OKeefe, Tom Curran and Sean Abbott will lead the bowling department. The Sixers may play with the same playing 11. Batsmen: James Vince, Moises Henriques, Jordan Silk, Daniel Hughes, Jack Edwards. Bowlers: Ben Dwarshuis, Steve OKeefe, Ben Manenti, Sean Abbott. Sean Abbott, Tom Curran, Jack Edwards, Moises Henriques, Ben Manenti, Josh Philippe, Jordan Silk, Justin Avendano, Ben Dwarshuis, Mickey Edwards, Dan Hughes, Steve O’Keefe, Lloyd Pope, James Vince. Marcus Harris, Sam Harper, Tom Cooper, Mohammad Nabi, Daniel Christian, Kane Richardson and Jack Wildermuth are the key players of Melbourne Renegades Team. Tom Cooper will lead the MLR team. The MLR Team management has announced 13-players squad. They have made one change in their squad. Kane Richardson has been included in the squad in place of Jon Holland. Holland has joined Cricket Australia XI team. Marcus Harris, Sam Harper and Tom Cooper will lead the batting department. Harry Gurney, Jack Wildermuth and Kane Richardson will lead the bowling department. Kane Richardson will replace Joe Mennie in the playing 11. Cameron White may get a chance to play today in place of Mackenzie Harvey. Batsmen: Tom Cooper, Marcus Harris, Mackenzie Harvey/Cameron White. All-Rounders: Beau Webster, Daniel Christian, Mohammad Nabi. Bowlers: Cameron Boyce, Harry Gurney, Jack Wildermuth. Tom Cooper (Captain), Dan Christian, Marcus Harris, Mackenzie Harvey, Mohammad Nabi, Beau Webster, Jack Wildermuth, Cameron Boyce, Harry Gurney, Sam Harper, Joe Mennie, Kane Richardson, Cameron White. Fantasy Cricket Pro Tips: The above players are most likely to perform today. You can take them as a captain and vice-captain. You can also select captains from playing 11. The last time when they played against each other in BBL 2019, Sydney Sixers have defeated Melbourne Renegades by 33 runs. The top-order collapsed and failed to leave any impact. If we look at the statistics of the last five matches of SS vs MR, SDS has won 4 matches and MLR have managed to win only one game. According to Crix11 astrology prediction, SYS will win the match today. The team winning the toss should opt to bowl first as the team winning the toss have won four matches out of six. According to Crix11 astrology prediction, SDS will win the toss and ask MLR to bat first. The match will be played on Wednesday, January 16, 2019. Match Big Bash League 2018-19, SYS vs MLR, 32nd Match. Venue Sydney, Sydney Cricket Ground. So far two matches have been played on Sydney Cricket Ground in this BBL and if we look at the behaviour of the pitch, the pitch was neutral and has helped all the three departments. It is predicted that the wicket will behave the same in 32nd match also. The one who will bend their back the most will be benefited the most. Dream11 Fantasy Cricket Tips: Try to take quality batsmen and quality bowlers in your Dream 11 Fantasy Cricket teams. The weather of Sydney is forecasted to be sunny in the morning and it will remain the same throughout the day. The sky is clear and there is no sign of rain today. A hot and humid day is predicted. The temperature is expected to be 26-Degree Celsius and the humidity to 72%, which may go up to 89%. Fantasy Cricket Expert Tips: The weather condition may favour the batsmen and the spin bowlers. SDS vs MLR Dream11 Tip of the Match: Try to take four top-order batsmen, two all-rounders and three bowlers. This is it for Today’s SDS vs MLR Dream11 Fantasy Cricket Match Prediction of 32nd Match. Read the complete post and win in any fantasy cricket league. Leave a comment below and share the post so that others can also find Crix11 which is the best fantasy cricket prediction site. Don’t forget all the information on this website is absolutely free and if you utilize the data correctly your winning chances is 100% sure.